Do you also hate not knowing your armor rating when you equip a new piece of armor? Do you want to know when you've hit the softcap for magicka? Was it when you equiped your third, or fourth piece of light armor? So do I. Thats why I created this addon. The window can be moved and positioned wherever you want. I recommend below (screenshot) or upper left corner. I'd like to make a request that the location of the window be remembered. Any chance to make the display toggled on/off with a kaybind instead of just showing when the inventory window opens? Love the addon but for some reason it is not showing the resists. It claims they are 0% but they should be higher with natural resists and armor. would it be possible to have those stats also shown if you are at a vendor, vendoring? Thankyou so much dude! i haven't tried it out yet, but i just saw this pop up on Minion. I've been looking for someone to create this addon since early access. I mean you can of course record your stats before equipping a piece of armour and then equip it and record your changes, but thats a whole lot of work each time u equip a piece - and no just because items have 1 stat in ESO, you have to take in to account passives that increase stats/armour e.t.c. Its a shame they took the exact interface from skyrim, because only being able to view 1 thing at a time is a very limiting thing. 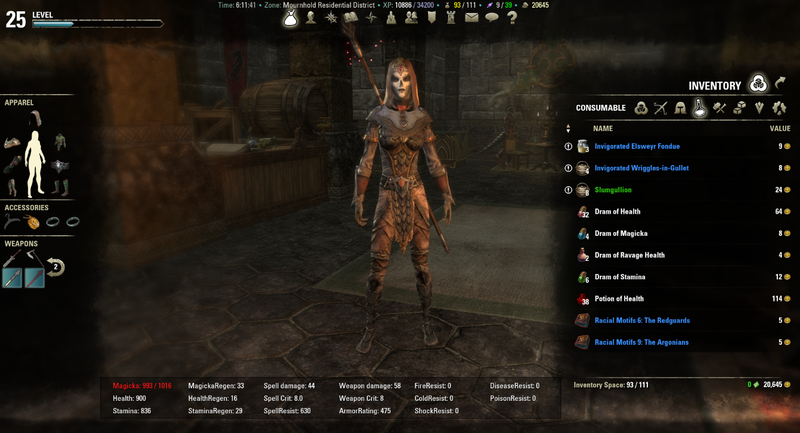 In other MMO's you can open your bag, your character screen and your talent screen all at once for example. Which gives a lot more information on the screen at once. Maybe one day this will be possible. I have been checking Minion daily and i have 30+ addons on a time, however this is one that i've been looking forward to more than anything, it is simple yet something that is needed IMO. The feeling of getting a new piece of gear and actually seeing the stat change then and there and seeing the difference good or bad - maybe the item has magicka instead of stamina, but that pushes you over the softcap and makes it worse. You are presented with 0 information of this with the current UI. Last edited by lightstylez : 04/19/14 at 10:44 AM. The point of This addon is seeing stats when in the inventory screen To help You Pick the right armor. Can you add block stat from Dragonknight passives, well and other "hidden" stats if you find them? That's not a priority right now but i will look in to it later. The problem is, the more you display, the bigger the window becomes. It doesn't calculate stats from passives. As Dark Elf - I have 1575 fire resistance. It would be nice if you can add it. EDIT: It causes fps drop while entering/exiting inventory. You are correct about the fire resistance. i'll have to look in to it. On opening the inventory screen, the add on starts calculating the stats on every frame. I didn't notice any performance drop on my system, but i am looking in to a way to decrease the calculations per frame. Last edited by CoUsT : 04/17/14 at 03:48 PM. Last edited by WoWLoreConfusedMe : 04/17/14 at 12:21 PM.